Humans produce 36 gigatonnes of CO2 per year worldwide. That’s more than 79 trillion pounds of carbon dioxide! Nearly 20% of these emissions are derived from transportation. offCents enables you to offset your footprint from travel one pound of CO2 at a time. Once we have detected travel, below is the methodology we use to determine your emissions. Each gallon of gas combusted while driving emits 19.6 pounds of carbon dioxide. offCents utilizes the miles per gallon (mpg) of your vehicle to determine how many gallons you combust on each trip. If a vehicle is not input, offCents defaults to a mpg of 20, which is about the overall average for motor vehicles. So, an average car combusts about 1 gallon for every 20 miles driven, or 1 lb of CO2 per mile driven. A number of factors are considered in calculating emissions from aircraft. An airplane emits more emissions at takeoff and landing. Therefore, long-haul flights are generally the most efficient in terms of emissions per mile. However, average seating capacities, load factors and proportions of passenger types must be considered as well. 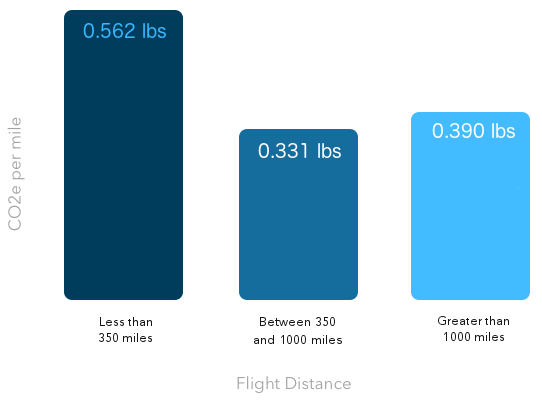 Below are the average emission factors for flights within their respective distance ranges. 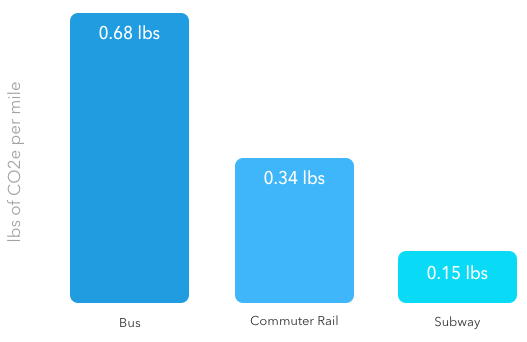 We calculate all bus, commuter rail or subway rides based the lbs of CO2e per mile as shown below. Calculating your exact carbon emissions requires consideration of multiple variables. However, with some of the most basic inputs, we can calculate it pretty closely. offCents will continue to update and refine our methodologies. We look forward to helping you reduce your carbon footprint!